Are You Up to the Open Data Challenge? Uncover insights from public data using Qlik Sense and you could win $10,000! It’s that time of year again – turkey sandwiches, holiday shopping insanity, and we are bringing back the Qlik Open Data Challenge! Starting on December 15, we invite participants to use Qlik to uncover unexpected insights from public data that could have an impact to positively change the world. What’s even more exciting about this year’s event, is that it marks the first time the challenge will be conducted in Qlik Sense! Participants will be asked to use free, public data from http://www.datacatalogs.org on issues such as the environment, populations, education and health to create an app in Qlik Sense that not only analyzes, but inspires users to take action. The app finalists will be judged by members of Qlik Community, as well as some surprise celebrity judges and Top 3 apps will be judged by the public! Past winners typically follow a storytelling narrative around the data, often using and linking to outside content to support it. 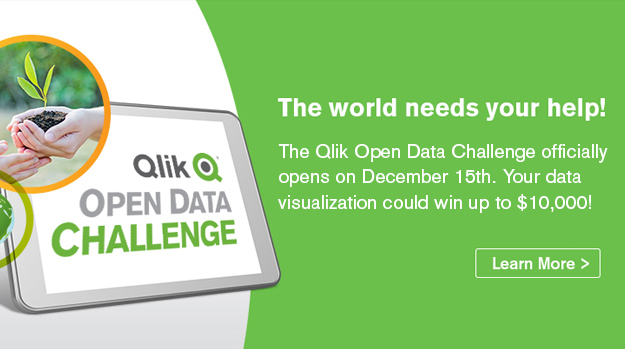 On 12/15 we invite you to take the #Qlik Open Data Challenge for a chance to win $10K! 1st Place for Best Overall App ($10,000): “Do You Realize” tells the story of how big the human impact is on the planet, making users of the application realize that everyone can make a difference. It offers access to multiple sources of information, including videos assets, and encourages people to take action. 2nd Place for Best Overall App ($5,000): According to the National Adoption Database (CNA), there are more than 5 applicants (singles or couples) aspiring to adopt per child. “Adoption in Brazil” uses data in an attempt to explain why there are so many children waiting to be adopted in a time when more applicants are trying to adopt children. 3rd Place for Best Overall App ($2,500): “Italian Schools Navigator” describes the Italian school system into its constituent elements: institutes, teachers, students, infrastructure, and costs over the territory. Users can compare schools by territory and type and view location results on an integrated Google Map. Winners not only earn street cred and bragging rights, but their apps will be featured on the Qlik demo page. Think you’ve got what it takes to create an app that can change the world? Put your data viz where your mouth is and step up to the Open Data Challenge!